The longest music piece in the world is being performed in the city of Halberstadt in Germany: John Cage's composition for organ ORGAN2/ASLSP - As SLow aS Possible - is resounding here in an extreme interpretation of 639 years, that means until the year 2640! Halberstadt is a town (43,800 inhabitants in 2015) in the German state of Saxony-Anhalt, and the capital of the district of Harz. The performance began on 5 September 2001, the 89th birthday of the avant-garde composer and artist John Cage, with a seventeen month-long pause before the first tone of the organ, especially built for the performance of this piece, was to be heard. What at first seemed to be only an utopian idea developed very quickly into an impressive and innovative art project generating a widespread interest. 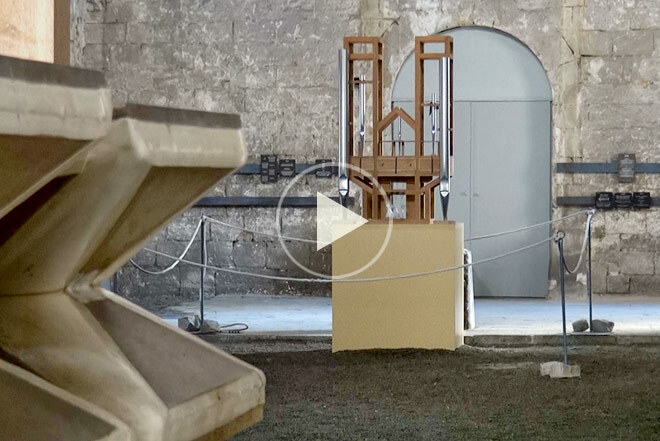 The Halberstadt Cage concert, which fascinates people all over the world, is being accompanied by many additional events and has proved to be a point of attraction wholly in the open spirit of John Cage. Aside from tone changes as determined by the organ piece, further events are taking place in the course of the organ project. In 1985 ASLSP was created as a version for the piano, but in 1987 John Cage changed it for the organ at the suggestion of the organist Gerd Zacher. The question of how to realise the opus, leads to the conclusion that "as slow as possible" can be thought and played indefinitely - at least as long as the life of an organ lasts and also as long as peace and creativity in the following generations exist. But the question remained: How long should the piece be? The first organ performance was 29 minutes. A recent recording lasts 71 minutes. With this question as its point of departure, a project was developed over a time span that caused a worldwide sensation. Why Halberstadt and why 639 years? Michael Praetorius, a composer and important theorist of music of the late 16th and early 17th centuries, wrote that an organ with the first modern keyboard arrangement had been built in Halberstadt's cathedral in 1361. This organ was the first of its kind with a claviature of 12 notes, and this claviature is used on our keyboard instruments today. So one can say that the cradle of modern music was in Halberstadt. Subtract 1361 from the millennial year 2000, and the result ist 639. In the year 2000, - 639 years had passed since the "fatal day of Halberstadt" (Harry Partch) - the performance of Cage's "as slow as possible" for the coming 639 years began. The place is St. Burchardi, one of the oldest churches of the city. Built around 1050 at the behest of Burchard of Nahburg, bishop of Halberstadt at that time, this church functioned as a Cistercian convent for more than 600 years. In the Thirty Years' War (1618-1648), St. Burchardi was partially destroyed, but was rebuilt in 1711 and secularised by Jérome, the brother of Napoleon, in 1810. For 190 years the church was used as a barn, hovel, distillery and a sty. St. Burchardi was rediscovered, and is now the venue of this extraordinary project, that has aroused the fascination of many people around the world. In view of our fast moving age, this piece of music is a way of trying to slow down our hectiv lives. The "discovery of slowness" and the planting of a "musical apple tree" can be understood as symbols of confidence in the future. The length of this performance symbolises not only, and that was Cage's intention, the perception of music or a piece of music. It also means the perception of time, supposed standstill and transitoriness. As a generational project, this piece of music resists fast reception, the simple solution which is preferred in our society. © Text from a leaflet of the John-Cage-Orgel-Stiftung Halberstadt. * 5 Sept. 1912, Los Angeles, USA. + 12 August 1992, New York. Composer, music theorist, writer, artist; one of the protagonists of the post-war avant-garde.